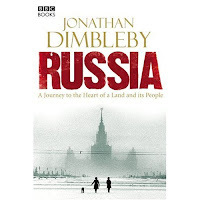 Last week I went to hear Jonathan Dimbleby lecture at the Royal Geographic Society, about his book and TV series on Russia. He’s an entertaining and, I think, genuine speaker – he doesn’t seem pre-programmed and although he talked from notes he was engaging and off-the-cuff. Also, he didn’t just rehash the TV programme, but instead tried to give his listeners a different insight, which was fascinating. He thought twice when the BBC asked him to do the programme, as it was a new venture for him, but decided it would be interesting to see if he could unravel Churchill’s famous quote, “Russia is a riddle wrapped in a mystery inside an enigma”. It’s a country of extremes, Dimbleby says rightly, not just extreme temperatures but extreme wealth and poverty, extreme emotions and extreme temperaments (this last he illustrated amusingly with tales of reckless drivers and sailors). His newfound fondness for the Russian people shone through; a people that can initially seem cold turned out to be welcoming, tactile, entertaining and amusing, and, he emphasised, have a deep-rooted fondness for us, as their war-time allies, which the Brits sadly rarely display. Furthermore, Russia has such a complex and often tragic history that we cannot under-estimate the significance of it in understanding its people – while this is of course a truism for any country, Dimbleby explained carefully how this is particularly true for the Russians, still recovering from the scars of the past. I won’t go into too much detail here, but he covered a multitude of aspects of Russian life – from politics (obviously) – he’s sceptical about Putin and Medvedev, and is surprised by how many Russians revere Stalin, and feel that Communism had more to offer them than democracy – to agriculture, history, and particularly literature, which he read on his long train journeys and includes discussion of in the book (which I haven’t yet read). In fact I even managed to have a brief discussion with him about Russian literature at the end of his talk. I was impressed by how much ground (physically and metaphorically) was covered in the lecture, the series and the book; there are plenty of amusing anecdotes, but Dimbleby patronises neither his subject nor his audience, and takes his analysis very seriously, which makes a welcome change in the current “bitesize” media world. The Royal Geographic Society, of course, provided a wonderful setting for this; wonderful to think of all the lectures that have taken place there, discussing the world of which we once (and perhaps still) knew so little. Stumbled across your blog whilst searching for Mr Dimbleby’s Russia book and TV series . Well thank you very much! I do my best!